I was inspired (and got the recipe) to make these muffins by another Mum at my Mothers group, our 1 year olds were going to town on them. I love finding new healthy recipes for snacks and lunches for my now toddler. 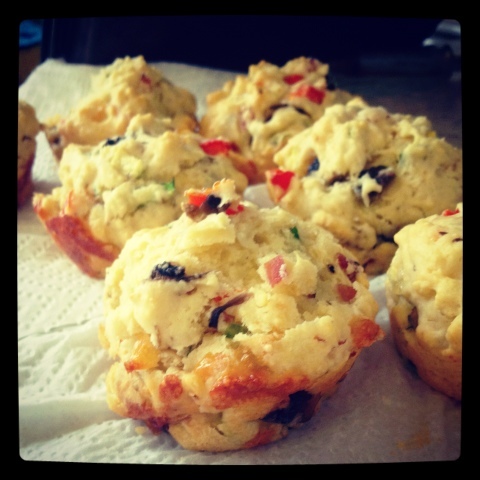 These muffins have zucchini, capsicum, ham, mushroom, parsley and mozzarella cheese, and were delicious! 12 comments on "Wordless Wednesday: Toddler Snacks"
They look yummy! Not sure if my currently fussy 2 year old would pick everything out...maybe I have to purée everything lol. Will check out recipe though -great idea for a snack! yum yum!!! can I come over for afternoon tea? That sounds like a great idea, I am definitely going to check these out and file away for making for Mia in a month or two. oh yum! my little girl would love these. Oh I would love these too. Haha I am so not looking forward to that stage! No worries! Thanks for hosting, glad I could participate!! I love my Mums group, it is so good to have such a great group of ladies who are going through all the same stuff, makes you feel so much better!